Welcome to my blog! 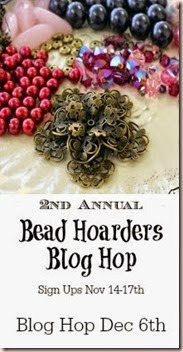 I’m so glad you came by to see what I made for this year’s Bead Hoarders Blog Hop! My generous partner Terri sent me a lovely bead she had hoarded and some pieces she made. With her permission, I decided to use one of the beautiful pieces she made for the bracelet and two beautiful drops for the earrings. 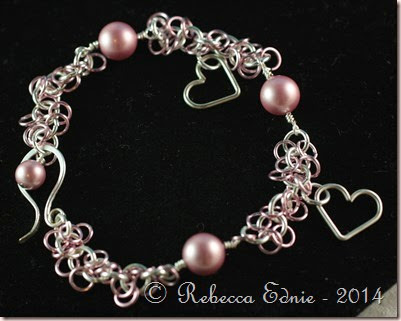 Isn’t the ceramic roses bracelet piece lovely? I added it to some sari silk in gold. I wrapped it twice, once with the roses piece along with a couple of crystals and next with a piece of chain sewn to the silk. From the chain hangs some antique bronze/gold findings and some more crystals. I wear it so the dangles hang down over my hand. 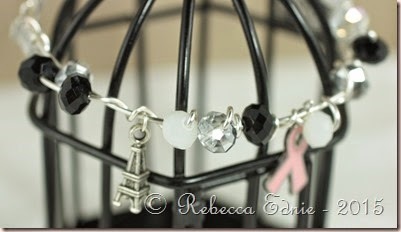 I added the charm to help weigh down the clasp so the bracelet doesn’t flip upside down. Its fun to add a little something extra anyway. The earrings are pretty simple but I love the simplicity of them. I don’t post jewelry very often but if you are interested in seeing the odd piece and some lovely cards I make on a regular basis, please subscribe! If you like what you see, let me know! So have you heard about this challenge? 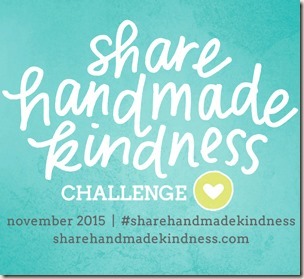 Jennifer McGuire started this challenge to share something handmade with others. This week we were to share with friends or family. I made this necklace for my BFF. She is a piano player, teacher and general music lover. 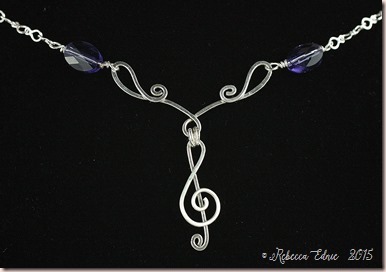 I know that she adores the shape of a treble clef so I made her a treble clef pendant out of sterling silver wire. I’ve already given it to her and she LOVES it. Now I have to wonder what the coming weeks will bring if we’ve already covered friends and family! I’ve been making jewellery again! I find it really creatively inspiring to try making something other than paper crafts once in a while. 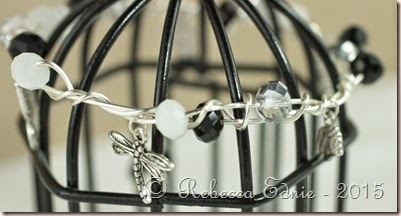 I started with a typical wire bangle but used much more wire. When I finished the first round of wire, I made sure it fit me perfectly then just kept wrapping! 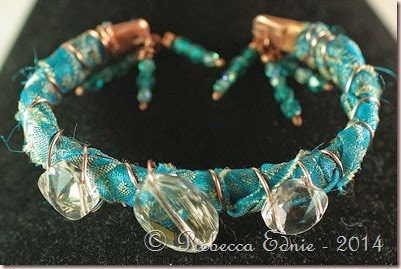 Some of the beads were added to the bracelet at the beginning and some in the subsequent wraps. I added the charms last. This may seem difficult but I assure you it isn’t. If any one would like to know how, maybe I’ll make a video! There is room for more charms if I want to add more. I also made some earrings to match. 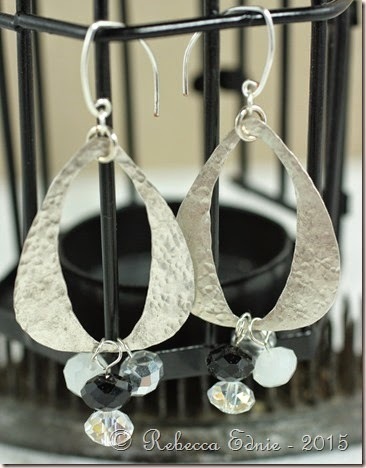 The earrings are made from silver sheet that I sawed myself. Then I textured the metal with a ball peen hammer. I also made the ear wires. The Chinese Crystals are from ZnetShows. They have the most gorgeous beads. These arrived in a mix of the black, clear and white. Some of the clear ones however, have a silvery coating on half the bead. They are so shiny! I have also made a barefoot sandal using these beads but I need a pedicure before I can photograph it. They also make the best cultured sea glass beads, pendants and pieces. Full disclosure, I was provided with these beads but I wouldn’t use them unless I thought they were high quality. 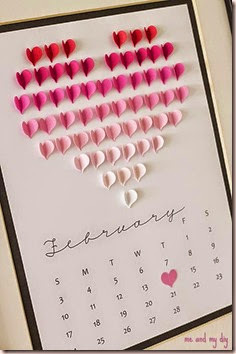 There are so many challenges involving love, hearts and the red, white and pink colour combo around right now. I though it might be fun to enter a few. I was super inspired by the photo from TSTR week 245. How cute. I wanted to use the rows of hearts but not recreate them literally. So I made myself some patterned paper with the latest PTI Market kit. 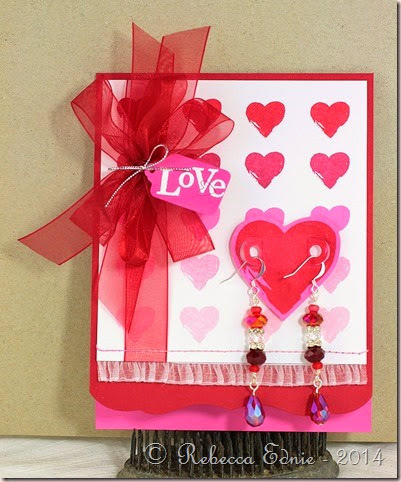 Part way through, I decided to add a heart with earrings to make this card a bit more special. 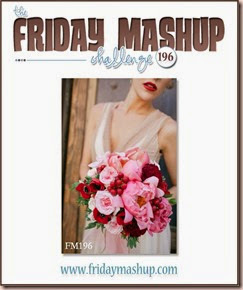 I’m also playing in the Friday Mashup and Simon Says Stamp Wednesday challenge to use bright colours, All Things Bright and Beautiful. And also Simon Says Stamp Monday challenge H is for… I used Hearts and heat embossing. 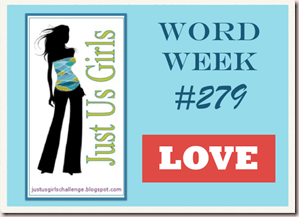 And last but not least, JUGS challenge Word Week LOVE. I pulled out some beads I’ve been meaning to use and made a necklace and a bracelet. I have to admit, these pieces don’t use special, hoarded beads. But I haven’t been amassing a stash for very long and the only beads I’ve had for a while are super boring and on their way to donation. There’s a difference between old and hoarded. The former is kept though their usefulness is pretty much over because we hope they might come back in style or we might need them again and the latter are saved for a really special project. Lots of oldish, not so much hoarded. 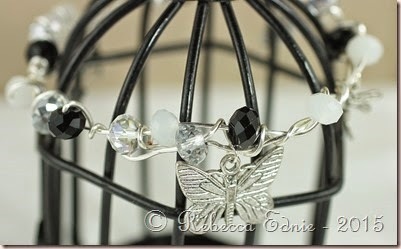 This one is made from Swarovski pearls and crystals. 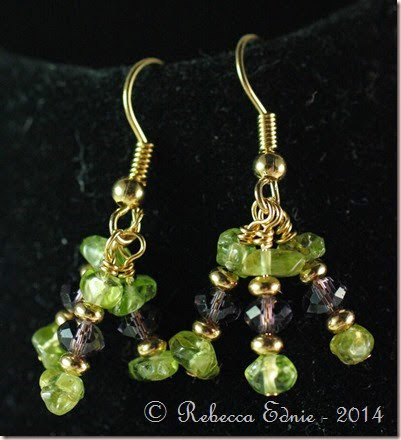 I bought them to go with a strand of tourmaline chips. I should have known better than to buy chips. I love when other people use them but I never seem to get them right. I tried to make the necklace I saw in my head but it just didn’t look right. The chips were too big and the Swarovskis too small. They were too close to the same size. As I unstrung the necklace, I ‘saw’ this! Yeah! So lovely. I know it’s pretty simple but I’m happy. 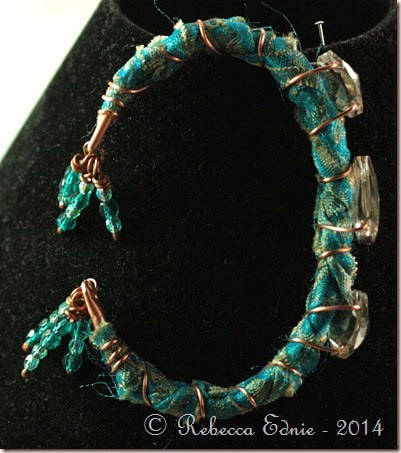 I saw a book or video ad for jewelry made from copper tubing and I was so inspired! This is made from about 6” of copper tubing formed into a bangle shape. I rounded the raw ends, filed them and punched a hole. I wrapped some awesome fabric around the bangle and held it in place initially with a clothespin and then permanently with 20g copper wire. While wrapping, I added some Swarovski crystals; they look clear but are actually silver shade. Lastly, I hung some Czech crystal dangles on jump rings which I attached to the ends. Rebecca Ednie Http://eclecticendeavours.blogspot.com You are here. 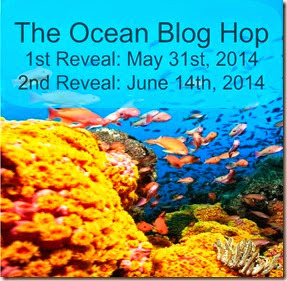 Welcome to anyone new to my blog! 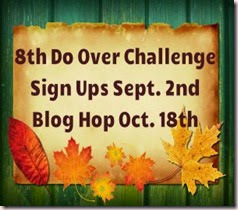 I’ve joined a blog hop today and the theme is a do over challenge. Jeannie, a jewelry designer, has offered some of her old pieces for us to redesign. 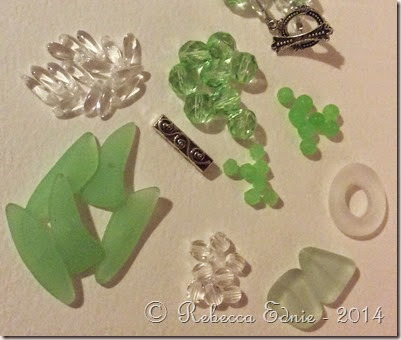 All we had to do was pay shipping, promise to use at least 50% of the beads in the piece and blog about it today! I was provided with this necklace and earrings. 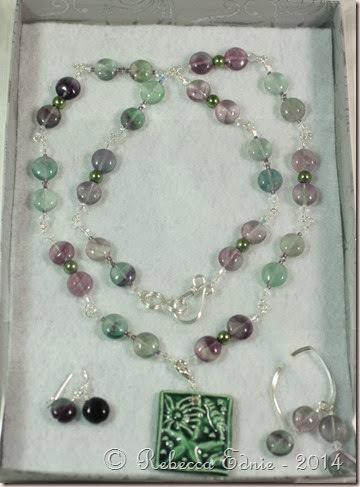 For my first piece, Heathered Elegance below, I used the large amethyst nuggets and the tiny green nugget beads, maybe peridot? but it is much darker than any peridot I’ve seen and also includes some dark flecks. 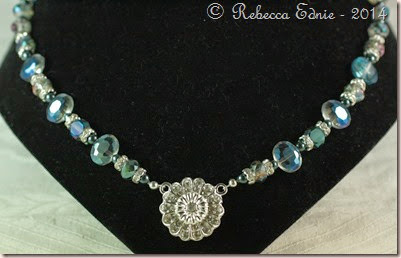 I added the filigree with wire guardians so the wire wouldn’t lose it’s coating or even fray. I gently shaped it with bracelet bending pliers to give it a nice curve. 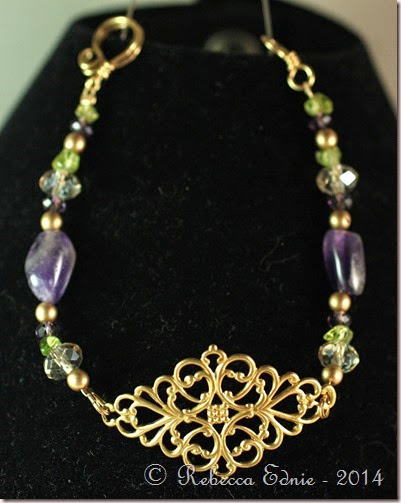 I used the original clasp though I reshaped it to make it shorter (my bracelet was getting too long), the original beading wire and some gold Czech druk beads along with Znetshows Chinese crystals, rondelles in two sizes and colours, Champagne and a lovely deep purple. I also made earrings to match. You can see the gorgeous purple rondelles better here. I love the sparkle! 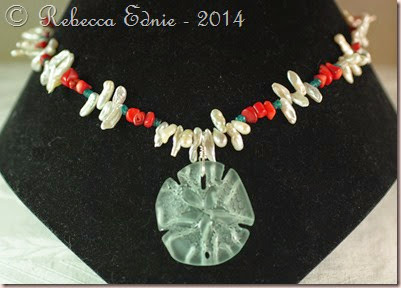 Next I made a necklace using the coral coloured nuggets from the necklace. They may be real (dyed) coral, I’m not sure. I added some stick pearls and tiny teal beads (some gemstone but I forget what they are). 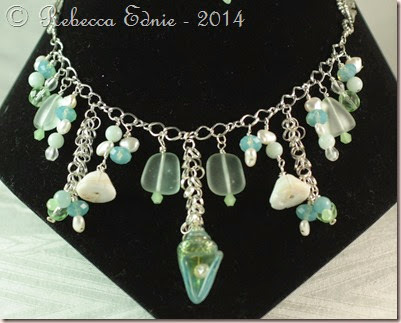 The pendant is a Cultured sea glass piece also from Znetshows. I love this pale Coke bottle colour. It goes with so many things. I made the bail with 20 gauge silver wire. 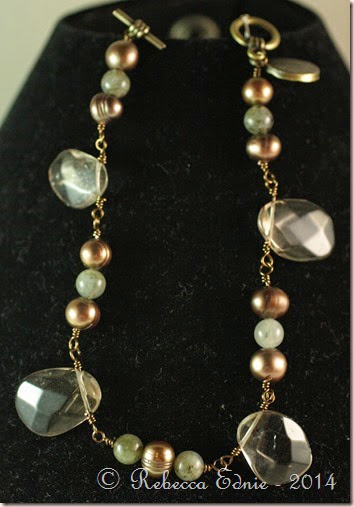 Last but not least, I made a bracelet with the bronze pearls, antique bronze charm and grey/green gemstones. I call it Bronze Age. The gemstones are pretty interesting, at first they seem quite ordinary but in the light, they have lovely iridescent flecks like tiny opal chips deep inside. 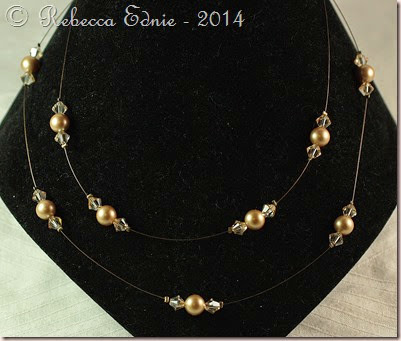 I only added the smoky quartz flat briolettes and clasp. It’s way too big for me but I thought shortening it would mess up the rhythm of the piece so I guess I’ll give it to or sell it to someone else. I hope you enjoyed my pieces! Here’s the list of the other designers in the hop in case you’d like to see more. I absolutely LOVE this and can’t wait to wear it. 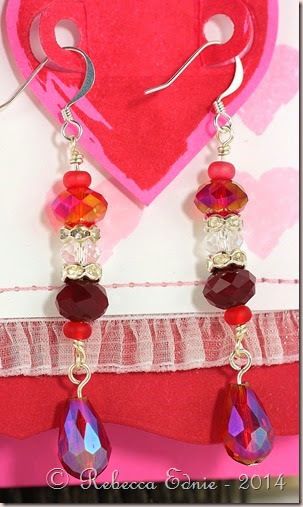 The finish on all the beads is an interference coating. Which means the beads look different depending on the way the light hits them. Yeah! The rondelles are Chinese crystals from Znetshows, those are the first crystals on either side of the pendant. Then they continue in an ‘every other’ pattern with some other crystals. I think the colour is called Sahara Green. But they also look sort of purplish in some light. Lovely! Interestingly, the pendant is actually also the clasp. It’ s magnetic! Cool right? When I first got these crystals, I wasn’t very impressed. But once I got other beads to go with them, I am thrilled! I am on the Znetshows Design Team! 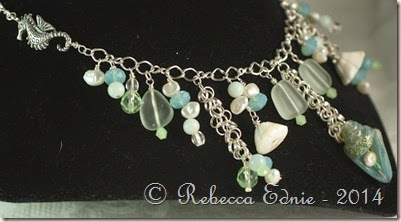 They make the most marvellous cultured sea glass and carry a wide variety of glass pearls and Chinese crystal beads. 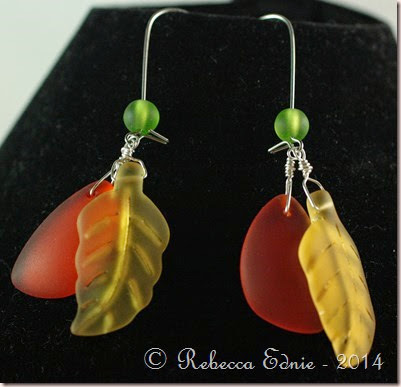 Today I’m featuring the fabulous cultured sea glass. They have so many colours and shapes. I love how these bright colours work so well together. I added each of them to the basic ear wire with a briolette-style silver wire wrap. The green bead is actually on the ear wire. There was a kink in the end of it but I straightened it then kinked it back in place to keep the bead from falling off. 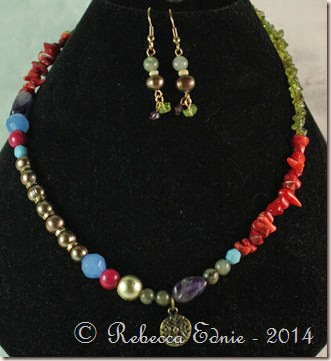 I used round beads, eclipse shaped pendants and the leaf shapes. These were super easy to make, they only took about 15 minutes. They would be great to make assembly line as gifts!